Wendy Chen Hsuan-yu of Australia secured her fifth straight Oceania Badminton Championships gold medal with victory over compatriot Yingzi Jiang in the women's singles final in Melbourne. Chen, who represented the country at the 2016 Olympic Games in Rio de Janeiro, fought back from a game down to beat Jiang 17-21, 21-16, 23-21. The result saw Chen, who was born in Taiwan, continue her dominance of the Oceania Championships and maintain a winning streak which stretches back to 2015. "It was a tough match today, I came off surgery recently and I'm just happy to be on court," the victorious Australian player said. "There were ups and downs, but I managed to save it for the win." Youth Olympic Games silver medallist and sixth seed Oscar Guo of New Zealand sealed the men's singles crown as he ousted Rémi Ross of Tahiti in three games. 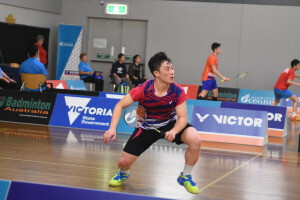 Guo, a member of the New Zealand squad which earned team silver at last year's Youth Olympics in Buenos Aires, battled to a 24-22, 20-22, 21-15 win to clinch his first continental title. "I'm very happy to win this title," said Guo. "Rémi played a really good game and it was a tough match, especially when I was up in the second game, I had to dig deep to bring it back." Australia were guaranteed the other three gold medals on offer today as all three doubles finals were contested by players from the nation. Gronya Somerville and Simon Wing Hang Leung won the mixed doubles gold medal by defeating Sawan Serasinghe and Lee Yen Khoo 21-18, 21-15. Somerville also claimed victory in the women's doubles, partnering Setyana Mapasa to a commanding 21-10, 21-9 win over Yingzi Jiang and Louis Ma. Serasinghe recovered from the mixed doubles disappointment as he joined Eric Vuong to win the men's doubles thanks to a 21-17, 21-10 triumph against Wing and Mitchell Wheller.